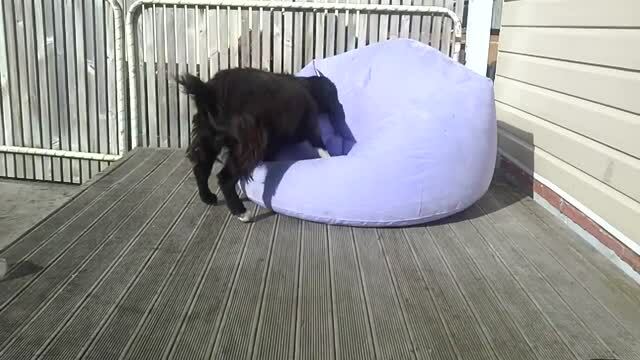 This Goat Is Trying To Balance On A Blow Up Chair! Think He Can Do It? Dynamo the Goat is my new favorite animal, ever! Here he is, testing out his balance skills on a blow-up chair outside, and it’s just about the most hysterical scene. You can tell he’s getting a little frazzled and frustrated, running back to mom as if to ask her, “Why can’t I conquer this thing? !” So cute! Goats are usually great at balancing, so Dynamo is probably feeling a little insecure about his failed attempts. I wish I could help ya buddy, but I just don’t think it’s gonna happen. You’re still adorable though. You Will Never Guess What This Dog Does After Being Freed From A Fence By A Police Officer! Next story Can You Guess What These Mice Are Trying To Do? You Will Never Guess What This Horse Does When It Encounters Water For The First Time! Can You Guess What These Mice Are Trying To Do?